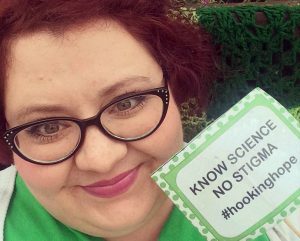 May is Mental Health Month, and it was my absolute pleasure to sit down and talk with Leslie Dyer DeHart, creator of Hooking Hope, a yarn bomb that will be installed at Central Oklahoma Community Mental Health Center in Norman, Oklahoma. Leslie, having seen the suffering of those struggling with mental illness, as well as experiencing those same issues first-hand, has an earnest desire to send messages of hope to those in need. I’ve known Leslie for years. She is an upbeat, funny, dreamer of a gal that has a passion for crochet and serving others. When she came up with the idea for Hooking Hope, she’d already changed my life with her down-home wisdom, her willingness to work hard, her drive to bring beauty into the world, and her firm belief in the goodness of people. Please join me in getting to know Leslie, and understanding her dream for Hooking Hope. What were your thoughts and feelings when you first started working for Central Oklahoma Community Mental Health Center? When I began working for Central Oklahoma Community Mental Health Center in Norman, Oklahoma, I remember feeling proud that I was a part of an organization that worked to make a difference in the lives of people in my community. I had learned from leaders in the mental health recovery movement and earnestly believed the message we tell those who come to us for mental health and addiction services; mental health and addiction disorders are no different from diabetes and heart disease. As a whole person, your whole body matters and that includes your brain. It’s not. In all honesty, I hit a rough patch. I began experiencing anxiety that left me doubting my value, my skills, and myself as a person. Suddenly I was the one who needed mental health treatment and everything that I had told countless others, I seemed to have forgotten. I felt like something was wrong with me. 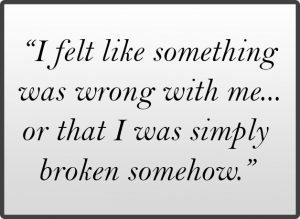 I felt that perhaps I wasn’t trying hard enough or doing the right thing or that I was simply broken somehow. Yes. I love to crochet. My great grandmother taught me as teenager and once I got it, I was hooked (pun intended). Crochet is a funny thing. It’s unassuming and yet it can teach so many lessons. I guarantee you that no piece I’ve ever crocheted is perfect. There are dropped stitches that I tend to hide with an extra double crochet here or there. I am also certain that at 90% of my projects have been at some state of completeness when I either changed my mind or lost track of a stitch count and ripped the whole thing out. You see, while I was worried that something about me wasn’t “perfect enough,” I was working on pieces in which I accepted any number of imperfections. Once I realized that something as imperfect as a baby blanket for my daughter still had value and beauty, I was able to work on changing the lens through which I viewed myself, even with a mental health diagnosis. What else has crocheting done for you? Not only was crocheting intrinsic to my recovery, it is my happy place and it has brought me new friendships. 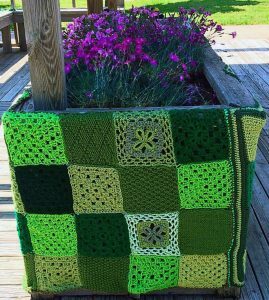 Have you ever noticed that when you’re crocheting (or knitting), people often walk right up to you and ask about your project? It is very hard to isolate yourself when you have something in your hands that invites people to strike up a conversation. Crochet was also the one thing I never doubted I could do. Mental health diagnoses may make you doubt your skill at work or your ability to parent or your value in a relationship but it never once convinced me that I wasn’t a badass with a hook and yarn. For people experiencing mental health or addiction disorders, it may only take one thing. One thing they can hold like a shield in the face of self-doubt. Crochet was my one thing. So, that brings us to Hooking Hope. How did that happen? In 2015, I tried to explain to my very puzzled director what a yarn bomb was. I explained that yarn bombs are community art projects designed to bring people together, to warm up cold and impersonal spaces and to brighten up a corner of the world. I reached out to friends in the crochet and knitting community. I talked to staff at the facility. I hounded my Facebook and Ravelry friends relentlessly. Eventually, many of those friends, colleagues, and family members were as excited to contribute to our first yarn bomb as I was. We had decided to install the yarn bomb during Mental Health Awareness Month and we picked a color scheme. The mental health center was going green! Green is the color of growth and recovery and has been used in awareness ribbons related to mental health recovery for years. We picked a target too. A gazebo sits in the middle of the adult services campus and we decided that would be our bright corner of the world. Donations were sent from seventeen states in the US and three other countries, and we covered the entire gazebo. What else did you do for the yarn bomb? 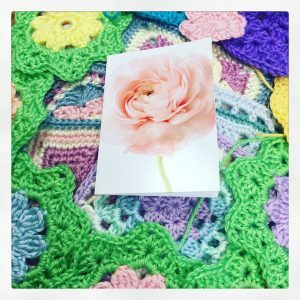 Individuals who were not able to contribute their handiwork sent messages of encouragement that were printed and pinned to the crochet and knit pieces for all to read. Staff and visitors were encouraged to post a selfie with the gazebo using the hashtag #hookinghope. Why did you call it Hooking Hope? Hope is a powerful thing. The thing that lifts you to your feet when you’ve been knocked down, encourages you to create when you feel empty, and reminds you that a bad day does not a bad life make. Hooking Hope was powerful and exciting. I watched people who were here for psychiatric services walk up and read through the messages of hope and encouragement that were pinned around the gazebo. Many took photos and I noticed that in each of those photos, they were smiling. A state operated mental health center is not always the picture of hope. People come here when they have nowhere else to go and life is overwhelming their ability to cope. But for the month of May, there was something novel to look at. Something that drew the attention of everyone on campus and inspired conversation. That’s why we are doing it again. Hooking Hope 2016 will be installed at Central Oklahoma for the entire month of May. This year we’re using every color. Contributors were asked to crochet and knit things that made them feel bright and happy. We have six states and two countries participating this year and have included one more site to our installation. This year, Hooking Hope will also be represented at our Child and Family Services campus. Where better to spark thoughts of resilience and recovery than in children? Who better to encourage hope in than families who are struggling? 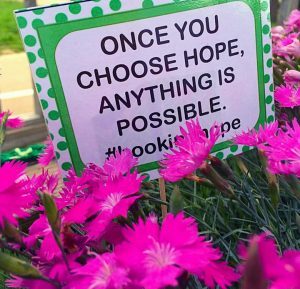 You’ve held the Hooking Hope yarn bomb successfully for two years, bring hope and color to the lives of hundreds – what’ve you got up your sleeve for next year? We will continue adding to the pieces we’ve already collected and hope that next year we can wrap at least a portion of each of the tree trunks that cover our campus. It will be fun to see how many bright and meaningful pieces we can continue to add to Hooking Hope and we have already had folks reaching out to participate in 2017! Do you want to say anything else to our readers? I still work at Central Oklahoma Community Mental Health Center. I still tell people their whole body wellness matters. I still have to remind myself that those words apply to me as well. During the month of May, when I walk to my office, past a gazebo covered in brightly colored stitches contributed by friends, strangers, and colleagues, it will be easier to hold onto the hope that recovery is real and the work we do matters. 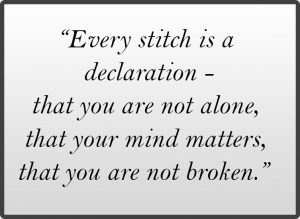 Every stitch is a declaration that you are not alone, that your mind matters, that you are not broken. It is my honor to hold onto that hope for the individuals we serve until they are in a place to hold it for themselves. We certainly hope that you will help Leslie in her Hooking Hope efforts next year. The joy and support it gives the community in Norman, Oklahoma, not to mention those that are participating world-wide, is something not often found in the stresses of our day-to-day lives. During our interview, Leslie talked about her “one thing.” The one thing that she held up as a shield when she was struggling. My one thing is crochet as well (go figure!). What’s yours? Share your one thing on social media with the hashtag #myonething to help share Leslie’s messages of hope for Hooking Hope! Would you like to participate in next year’s Hooking Hope? Like Hooking Hope’s Facebook page and keep in touch with Leslie for next year’s efforts!